Whether it’s a cracked chimney, or a damaged roof, that’s leaking water into your house, a water damaged ceiling is not something you should have on your hands for too long. After first fixing the source of the leak, you should check your ceiling for signs of water damage. 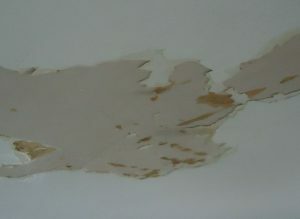 Here we will discuss how to repair water damaged ceiling paint. Repairing the paint on a water damaged ceiling is a simple enough process if you follow the steps correctly. As with any paint project, the first thing you should do is thoroughly clean the area. Use a damp cloth and some sugar soap to clean the area you want to repaint. Make sure you get rid of all the dust and grit on the surface. Finally, allow the area to dry before moving to the next step. Getting rid of the old paint is next. Use a paint scraper to remove sections of peeling or bubbling paint in order to make the surface smoother and easier to paint over. You’ll need to prevent future water damage from affecting the area. A water-based peel-stop or seal binder will do until the issue is resolved. Its gluey texture will permeate porous material and create a barrier that will stop any more moisture from seeping through. This step will also make the area feel much more solid, which is what you want for a flawless paint job. Allow the surface to dry out completely. After about an hour of drying, it is time to ready the surface for a fresh coat of paint. The best way to perform this is to apply filler, preferably a quick drying kind. Allow it to dry for at least a day. Some people have quickened the drying process by using a hairdryer, and there’s nothing wrong with that, but if you want the surface to dry out completely without any intervention, give it a day. After the filler dries out, sand the area in preparation for the paint job. The final preparation to make comes in the form of applying a water-based primer or sealer. Interior surfaces accept paint more readily when a sealer is used. Most primers and sealers can be used on different surfaces, so you shouldn’t have trouble finding an appropriate product. Ideally, look for a primer that’s designed for ceilings. The surface is ready to paint once it is cleaned, moisture-proofed, and primed. You can repaint the smoother surface knowing that it will survive future water damage. Depending on your taste, you can go for a colorful finish or keep it traditional with water-based enamel paint with gloss. Is Water Damage Ruining Your Home? Leaks in the roof and chimney can cause plenty of damage to your home’s interior if left to run amok. Knowing how to repair water damaged ceiling paint is important for your home. Also, patching up these leaks as soon as you detect them will help avoid the problem from ballooning.